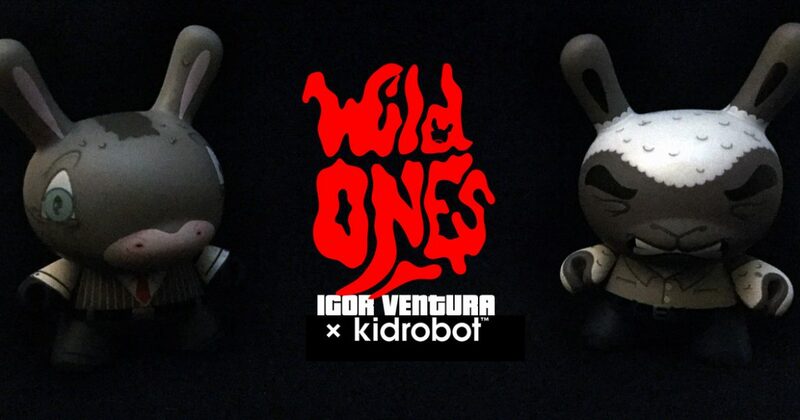 Recovering from a fitful night of slumber, we push forward with our expedition into the lands of the Wild Ones, a strange world populated by the characters created for Kidrobot‘s first Dunny series of 2018. Encountering a well-maintained piece of farmland, a crudely hand-painted sign reading “Animal Farm” at the outskirts of the property, we gaze with mouth’s agape as the animals themselves seem to tend for their communal needs. But a dark underbelly exposes itself, as the pigs have taken to walking on two legs and assumed dictatorial roles over the other beasts. And though it seems like an Orwellian nightmare made real, we actually have Igor Ventura to blame for this. And who is Igor Ventura? Starting his professional career in the accounting and planning departments of advertising agencies while still in college, Igor Ventura decided to focus on design and shifted to the creative department before graduating in 2001. Having enjoyed drawing and painting since a young age, Ventura always tried to find ways to flex his artistic muscles. But it would be a Chrismas gift from his wife in 2007 that provided Ventura a new outlet for his art, as his introduction to the Dunny form quickly escalated to him hand-painting them. And it was around the start of his decade-long involvement in the designer toy movement that Ventura met Sergio Mancini, a fellow Brazilian native whose friendship would accompany Ventura through the pair being key figures in the Most Wanted and Red Mutuca collectives. With Ventura gaining notice from Kidrobot’s 2010 Munny Munth contest, his Neandertown Executive piece awarded 3rd place for the Grand Prize, Best in Show, it would only be a few short years before one of his designs, Geek Force, was included in the company’s factory-made Art of War series (2014). Having revisited his fictional Neandertown with his handmade Art of War Rejects piece Bankruptcy! (2016), the artist considered centering his Wild Ones designs around this locale of brutal capitalism but he ultimately decided to re-interpret the socio-political world of George Orwell’s Animal Farm instead. With Orwell’s Animal Farm being an allegorical novella about the evolution of Communism in the Soviet Union and especially Joseph Stalin‘s rise and subsequent brutal dictatorship, the character of Benjamin the Donkey is one that is intelligent enough to understand what is happening but also apathetic enough not to do anything about it. Under his mohawk mane of painted hair decoration, Ventura’s rendition is attired in a finely fitted business suit with monocle upon one eye. While the animal characters in Animal Farm never wear clothes, aside from the pigs, the artist’s choice to alter this imbues the form with more immediately understandable meaning, Benjamin‘s attire separating him from the working class. And while the motto adorning his backside, “I will work harder”, was actually that of the dim-witted and loyal Boxer the workhorse, this choice brings to mind Benjamin’s futile attempt to save Boxer from being turned into glue at the pigs’ bequest, marking a turning point for the character, with Benjamin finally spurred to take action. Adorned in a black armband of mourning and remembrance, Ventura’s rendition seemingly twists the intent of the “I will work harder” phrase, turning it from a promise made by the working class into a declaration of overcoming one’s own apathy at the wrong’s around them. In contrast to Benjamin, Ventura’s Aries design depicts one of the nameless sheep from Orwell’s tale, it’s name derived from the scientific term for sheep, Ovis aries. Perpetual yes-men for the pigs’ regime in the book, their bleated propaganda of “four legs good, two legs bad” adorns the back of Aries‘ head. With Ventura clothing them in nondescript, blue-collar attire, it is his form’s facial features that are the most telling. Eyes closed to the truth surrounding him, blindly doing as he is told, Aries seemingly grits his teeth to endure this world that he has heedlessly wrought. Finishing out Ventura’s trio of Animal Farm-inspired designs is the Berkshire boar named Napoleon, an interpretation of the story’s true main villain and analogy to Stalin himself. Reminiscent of the dictator’s militant look after being titled Marshal of the Soviet Union and Generalissimo, the newly sculpted Dunny head and removable peaked cap accentuate Napoleon‘s fierce aesthetic. And while the backside is emblazoned with the most important of Animal Farm‘s Seven Commandments of Animalism, “All animals are equal”, smaller print afterwards adds the same eventually priviso as that in the book: “but some animals are more equal than others”. Post 8 of 9 in the series “Wild Ones Dunny Series” will be available on Wednesday, February 7th, 2018 at 12pm Eastern time.